He was born on 17-3- 1880 in White Street, which was in the Sneinton area of Nottingham; it would have been only a short walk from the current Sneinton Market. On his birth certificate his father is recorded as Arthur and his mother as Sarah. As was often the case his mother was not literate, because on his birth certificate the registrar has allowed her to put a cross stating that this is the mark of Sarah. He died in March 1949 at the age of 68 at the Nottingham city hospital. He had two older sisters Emily Ada and Helen (who appears to be known as Nellie from his army records) and a younger brother called Arthur. Samuel married Eliza Ann Hatton during 1906 and they had 5 children who survived into adulthood. They were Annie May, Samuel, Arthur, Charles (my father) and the youngest Evelyn. My father told me many years ago that there could have been more children, but as was often the case the family would have been affected by the high infant mortality rates of the time. I believe that no photo exists of Samuel in his army uniform. 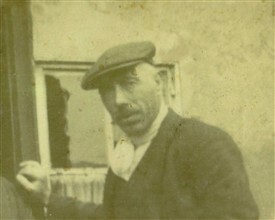 The attached photo has been taken from my family album and probably dates from the mid to late 1920’s. One of the army records he has completed is an attestation form dated 1902. It states his age as 19 and not 22. This inaccuracy could be due to his parents both dying at what now days would be considered quite young i.e., mother in her 30’s and father early 40’s. Indeed both my father and my auntie Evelyn (Ev’ as she was called by the family) said that he would not talk about his childhood. No one in the family I have spoken to knows where or who looked after the children. My dad said that he thought that Samuel and his younger brother Arthur would run away from some sort of institution or school. This was due to the harsh regime employed. They would only be returned for another dose of punishment i.e. canning and ended up going round the system again. My father did say Samuel and his brother would often spend a night in hedge bottoms where they would find scrap metal and collect it to sell for food etc. He would have had a certain amount of knowledge on the subject because his father and other relatives were already involved in the salvage industry. The title or description for the work was “Marine store Dealer”. This kind of upbringing may be why he, and his brother Arthur, joined the British Army for a new life. He would have clothing and 3 meals a day. On his 1902 attestation form his signature is not very good and is of a man who obviously struggled with his education. I was told by my auntie Ev’, that she knew that he was not good at reading or writing, but, he understood all about money! In WW1 he was assigned to Royal Marine Labour Corps and stationed with Northern command at Ripon in North Yorkshire. He was probably allocated to the Labour Corps due to a declared scar on his left eye. This would probably have affected his ability to fire a rifle. The labour Corps did many basic tasks for the army. Ripon was at that time a major centre for the army where I believe at its height up to 70,000 could be stationed there. This would be for training and preparation for the Western front or return and rest for troops. There was a large hospital to help the wounded recover. So what Samuels’s duties were I have no idea? He could have been in the stores, on the railway sidings or even grave digging, who knows. He was eventually sent to the see the medical board because of bronchitis. He was stated to have a degree of 20% permanent scaring on his lungs. There were no anti-biotics in those days. He was given a small gratuity, and was declared “No longer physically fit for war service”, being discharged in February 1918 at the age of 38. After the Great War he went on to spend the rest of his life with his wife Eliza Ann running their own salvage business. It was named “Samuel Pownall and son Marine Store Dealer”, which was situated on Radford Road, Hyson Green, Nottingham. In my own youth, if anywhere was left in a mess, I heard people would use a typical Nottingham slang term “it looks like Jackie Pownalls scrap yard”. One item I discovered in my research, and also a surprise to me was the extent of Pownall family involvement in the salvage industry. In the Wright Trade directory for Nottingham, published in 1920, there are 8 Pownall businesses listed. 7 are involved in the scrap or salvage trade with the description of “Marine Store dealer” used on 6 occasions. This would avoid the stigma of the everyday term “rag and bone” merchant. Time in Army 2 years 62 days. First joined army 1902 militia. (Notts and Derby Regiment). WW1; - Royal Marine Labour Corps regiment number 367746. Medals; - Victory and British War Medals. Sources; - find my past. Com – Ansestry.com – The Long Long trail site. Birth and Death certificates and also family recollections, also family photos. This page was added by John Pownall on 26/04/2015. My mother was called Eva by all. I have a photo of my father and Uncle Ted(Poenall) with a lorry dated between the wars. I have looked through my family records and I do not believe that I am directly related to you. Unfortunately I cannot remember any of my family referring to the people that you mention, or the shop at Gunthorpe. All my memories revolve around Hyson Green, Radford where I was born. Samuel who was my granddad lived in Hyson Green, where for many years he ran his Marine store business. The business was located on Radford road. However, when searching the internet, on a local site forum, I discovered somebody had written a good appraisal of the Pownall family structure. This person was actually trying to help to solve the old question of who was the original Jackie Pownall. She had discovered that a William Pownall (from Calverton) had married twice and fathered 20 children! It therefore would appear that most of the Pownalls in the Nottingham and surrounding area are descendants. Some were named John and many not. But the term “Jack” evolved and became synonymous with people in the Pownall family employed in the Marine store business. My own records also go back and lead to a William Pownall from Calverton, Notts. So, therefore in the loosest of terms, maybe we are all very very distant cousins!